Scrubs and other uniforms in the medical field are especially important for the everyday demands of the job. Particularly in the medical field, a uniform is a crucial component of the job. Not only do scrubs and uniforms maintain sanitary standards for the facility and patient care, but they also demonstrate professionalism and a team mentality for your entire staff. When you are responsible for providing uniforms for such a large team, why not rent them instead? Below are three reasons to consider it. Scrubs and other uniforms in the medical field are especially important for the everyday demands of the job. However, because of their frequent hands on use, they can often become worn and tattered over time. For this reason in particular, it is important to have clean and well maintained uniforms at the ready for your team so that they are always polished and presentable for patients throughout the week. With Lord Baltimore Uniform Rentals, we handle the cleaning, maintenance, and uniform replacement so you always have peace of mind that your staff is wearing clean and well maintained uniforms on the job. Uniform Rentals not only guarantee you clean uniforms for your team, but they are also a highly affordable option for any size staff. Particularly for hospitals or medical centers with a large team, purchasing uniform replacements can become costly over time. By renting your uniforms with Lord Baltimore, your team can look great and stay clean on a budget. In renting your uniforms, you are ensuring that everyone on your team is well represented with a uniformed presentation of your medical center. From scrubs to administrative uniforms, your patients and visiting professionals will appreciate the professional appearance of your staff in every part of your facility. 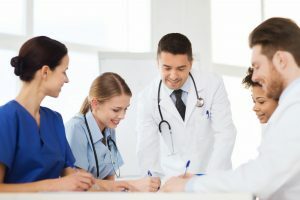 With this, the uniformity of everyone on your team will display a level of professionalism that patients will recognize and trust as part of your services. To learn more about how medical uniform rentals can keep you and your team safe on the job, please contact Joe Bateman at Lord Baltimore by calling 800-292-1224 or visit LordBaltimoreUniform.com. We also handle towel rental for gyms and salons, as well as apron, towel, uniform and mat rental and purchase for restaurants. Additionally, we also sell and rent uniforms, shop towels, fender covers and mats for manufacturing and automotive industries. This entry was posted on Friday, March 16th, 2018	at 9:41 am	. You can follow any responses to this entry through the RSS 2.0	feed. Both comments and pings are currently closed.